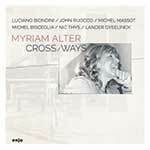 Myriam Alter – compositions; John Ruocco – clarinet; Luciano Biondini – accordion; Michel Massot – tuba, trombone; Michel Bisceglia – piano and arrangements; Nic Thys – double bass; Landers Gyselinck – drums. After two highly successful albums for Enja, it was time for Myriam’s sixth production of her unique, sometimes joyful, sometimes melancholic but always Mediterranean tinged music. 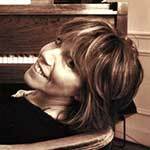 Myriam Alter received classical music training starting from the age of 8. Being very involved with her studies (graduating from high school, then getting a licence for psychology at the University of Brussels), she stopped practising her instrument at the age of 15.